Nykaa Paintstix! 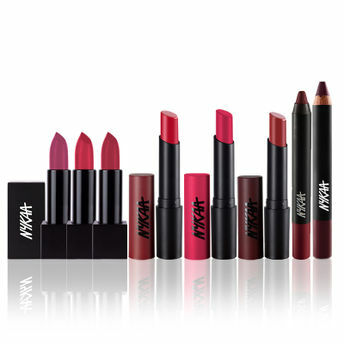 Grunge Brown : Back up and wind it with the Nykaa Paintstix! in Grunge Brown. This deep brown shade is sure to give you that trendy, 90 s grunge look! C'mon turn the stereo on and swing to the finest 90 s tracks with this delicious, irresistible shade. Nykaa Matteilicious Lip Crayon - Perfect Plum : Paint the perfect picture with the Nykaa Matteilicious Lip Crayon in Perfect Plum. This deep plum hue is powerful enough to make a statement and mysterious enough to keep things interesting. Take things in your hand with this mystical hue. Remember, a little mystery never hurt anyone! Nykaa Paintstix! Gold Digger 13 : Keep Hustling and never slow it down with our Nykaa Paintstix! Lip Crayon in Gold Digger. You?ll be in highlife, popping champagne in the sunlight, with this stunning dark pink shade. You?ve never had it so good! Go big on color and big on glamor! Nykaa s Paintstix boasts a remarkable formula that pushes the boundaries of color intensity with its rich and intense pigment. This supreme formula glides on your lips effortlessly, providing you with, undeniable saturated color in one stroke. It s time to go bold with Nykaa! Nykaa Paintstix! Lipstick - Bombshell Berry : Push and pull like magnets do, and let him stay amazed while you sway on the rhythm. This deep berry hue is all you need to keep things interesting. Put it on girl, Nykaa Paintstix! Lipstick in Bombshell Berry is handmade for a hottie like you!